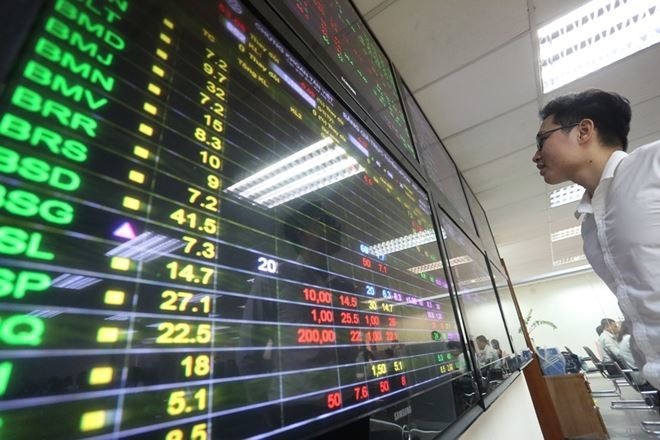 HÀ NỘI — Shares advanced across the two national stock exchanges on Monday, propped up by the growth of major industries. However, net selling by foreign investors may pose a risk to a longer uptrend. Extending gains from last week, the VN-Index on the Hồ Chí Minh Stock Exchange grew nearly 2 per cent to close Monday’s trade at 916.06 points. The southern market index increased 1.8 per cent last week. On the Hà Nội Stock Exchange, the HNX-Index increased 0.91 per cent to end at 103.95 points. The northern market index was unchanged last week. A total of 179 million shares worth a combined VNĐ4 trillion (US$172.6 million) were traded on the two markets. Most major stock groups recorded rallies on Monday. Technology stocks were the biggest gainers with an average growth of 4.8 per cent, driven by expansion of leading companies such as Mobile World Investment Group (MWG), up 5.4 per cent; Digiworld (DGW), up 3.3 per cent and FPT Corp (FPT), up 0.9 per cent. These were followed by financial and property stocks, underpinned by Vingroup (VIC) and VPBank (VPB), which both hit the ceiling growth of 7 per cent capped for a single trading day. Other big banks and real estate companies such as Vinhomes (VHM), Vietinbank (CTG), Vietcombank (VCB) and HCM City Infrastructure Investment (CII) increased between 1.5 per cent and 5 per cent each. OPEC’s expected output cut also pushed up shares of oil and gas companies. PV Gas (GAS), Petrolimex (PLX) and PetroVietnam Drilling and Wells Service (PVD) rose 1.5 per cent, 4.6 per cent and 1.9 per cent, respectively. According to Reuters, OPEC agreed to cut supply by one million to 1.4 million barrels per day from December after crude oil prices declined strongly, from the 4-year peak of $86.29 per barrel on October 3 to $65.47 per barrel early last week. “The market recovered strongly in the first trading session of this week thanks to optimistic investor psychology from positive information, such as the unlikelihood of US President Donald Trump imposing more taxes on Chinese goods,” analysts at BIDV Securities Co wrote in a daily market report on Monday. However, they warned the market was at risk of continuing net selling by foreign investors. In contrast to domestic investors, foreign investors offloaded shares, concluding as net sellers on the two bourses and responsible for total net sell value of VNĐ101.5 billion.